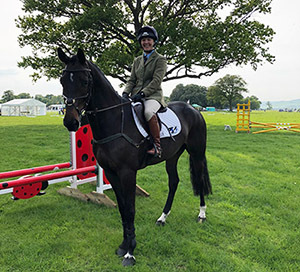 Laurence Hunt claimed victory in the four-year-old young horse qualifier, riding his own Juma (pictured). 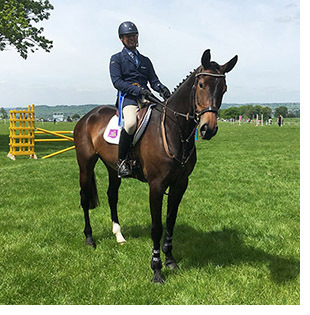 The pair scored 28 for their dressage, 36 for jumping and 14 for confirmation before being pulled in second for the ‘wow factor’ phase. Finishing on the same final score, and winner of the ‘wow’ phase was Kelly Aldous riding her own and Sharon Cousins’ Winair BDA. The BDA Equestrian homebred also scored 28 for the dressage, but 31 for jumping and 18 for confirmation. Juma’s better jumping score gave Laurence the win, although both pairs have qualified for the finals at Burghley in September. Third place went to Imogen Murray riding her own Jezebel HDH. The Etoulon-sired mare led the field going in to the final phase, having scored 29, 37 and 16 for the dressage, jumping and confirmation. The five-year-old honours went to Samantha Hobbs and I Diablo Joe (pictured). Owned by Geoffrey Burton, the son of Solaris Amoureux has been placed in both his affiliated runs this year, including finishing runner up in a BE100 section at Solihull last time out. Leading going in to the ‘wow factor’ assesment having scored 26, 38 and 17 for dressage, jumping and confirmation, Samantha added 9 points in the final phase to finish on a score of 90. Two points behind, in the runner up spot, were Caroline Powell and Chris Mann’s Rock Midnight. With individual scores of 26, 34 and 18, Rock Midnight gained the full 10 marks for ‘wow’ factor. Also qualifying were Imogen Murray on MD Sandyhills Penhills Zorro in third place with 85 points and Georgie Strang on Global Quest with 83 points.